It's hard to think of a more fundamental right than the right to determine what happens to one's own body. Forcing someone to undergo medical treatment against their will violates this most basic of rights—the right to be free from physical assault. To begin with, nobody has a "right" to a germ-free environment outside of their own property (and good luck establishing one there). Proponents of vaccine mandates assert this "right" as if it is a long-standing social or legal norm, but it is not. Human beings have been living among each other for millennia, and there has never been a widely asserted right to freedom from any and all pathogens at others' expense. There has, historically, been a widely held and asserted expectation of quarantine in the case of exceptionally dangerous illnesses. However, this is not at all what the proponents of mandated vaccines are calling for. Quarantine is simply the demand that those who are already infected with a disease remain isolated in their homes or elsewhere until they are no longer able to infect others. This is profoundly different from what the pro-mandate crowd demands: that those who are not infected undergo a medical procedure to minimize their chances of becoming infected. This is a much more intrusive demand and a potentially dangerous one. Furthermore, measles—the scariest thing the mandate pushers can come up with—is not even on the list of federally quarantinable diseases. Great article--should be required reading for all those who can't understand why it is completely unreasonable to expect me to vaccinate my child to protect theirs. The guy on the left side should be in a black tactical uniform, not look like he could be out shooting at targets or hunting. You're going to lose a lot of 2A supporters by using that photo. This photo is going to be misunderstood. 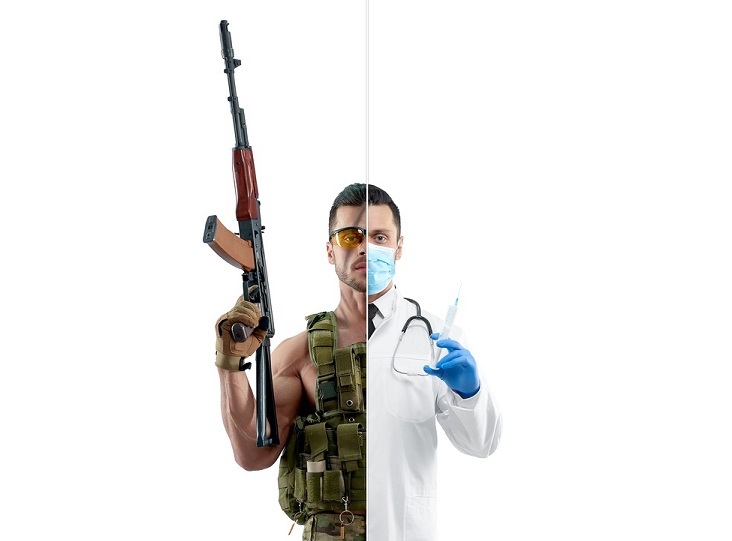 If you're trying to equate the vaccines being mandated, then the guy on the guy on the left should look like the swat team who is breaking down doors, like the ones who broke down the couple's door in Arizona. If you're saying that people need to rise up and take arms and defend themselves, most aren't going to identify with him because how gun owners have been vilified in the news.